Parmesan, roasted tomato, and spinach. Served with slices of baguettes and Caprice dressing. Made with Caprice bread. Please indicate in "Special Instructions" if you would like to add avocado. Please indicate if you would like pistachio or pomegranate or coffee or chocolate or vanilla or coconut or strawberry, raspberry, green apple, mint, tiramisu, Ispahan ( rose water), mango, passion fruit, lemon, caramel banana, cherries, lavender, or pear. Please indicate in "Special Instructions" if you would like to prefer a flavor of fruit or peer or pecan. Egg Omelet with Cheese on a freshly baked Le Caprice Butter Croissant. Please indicate in “Special Instructions” if you would like to add on your choice of meat or fruit. Egg Omelet with American Cheese on a Bagel. Please indicate in “Special Instructions” if you would like to add on your choice of meat or fruit. Scrambled eggs, cheese, shredded cheddar, Monterrey Jack, salsa and whole wheat tortilla. Please indicate in “Special Instructions” if you would like to add on your choice of meat or fruit. Scrambled eggs topped with cheese, tater tots, bacon, fresh tomatoes and freshly made bread. Please indicate in “Special Instructions” if you would like to add on your choice of meat or fruit. 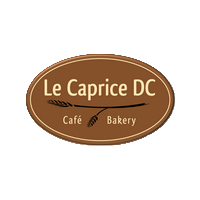 A composition of Croissant, Chocolate Croissant and other viennoiserie of Le Caprice DC homemade. Parmesan, roasted tomato, and spinach. Served with slices of baguettes and Caprice dressing. Please indicate in “Special Instructions” if you would like to add on your choice of meat. Fresh garden salad and Caprice croutons. Served with slices of baguettes and Caprice dressing. Please indicate in “Special Instructions” if you would like to add on your choice of meat. Please indicate in “Special Instructions” if you would like to add on your choice of meat. Mozzarella, tomatoes, basil, and olive oil. Served with slices of baguettes and Caprice dressing. Please indicate in “Special Instructions” if you would like to add on your choice of meat. Ham, turkey bacon, egg, and mixed greens. Served with slices of baguettes and Caprice dressing. Please indicate in “Special Instructions” if you would like to add on your choice of meat. Bell peppers, carrot, cucumber, sunflower seeds, and spinach. Served with slices of baguettes and Caprice dressing. Please indicate in “Special Instructions” if you would like to add on your choice of meat. Parmesan, cranberries, grapes, and mixed greens. Served with slices of baguettes and Caprice dressing. Please indicate in “Special Instructions” if you would like to add on your choice of meat. Roasted tomato, goat cheese, pecans, and spinach. Served with slices of baguettes and Caprice dressing. Please indicate in “Special Instructions” if you would like to add on your choice of meat. Chicken, provolone, tomato, and pesto. Made with Caprice bread. Please indicate in "Special Instructions" if you would like to add avocado. Mozzarella, tomato, and homemade pesto. Made with Caprice bread. Turkey bacon. Made with Caprice bread. Please indicate in "Special Instructions" if you would like to add avocado. Avocado, cucumber, tomato, and hummus. Made with Caprice bread. Please indicate in "Special Instructions" if you would like to add avocado. Goat cheese, cucumber, roasted tomato, and pesto. Made with Caprice bread. Please indicate in "Special Instructions" if you would like to add avocado. Made with Caprice bread. Please indicate in "Special Instructions" if you would like to add apricot or fig spread and avocado. Chutney with turkey or apple. Made with Caprice bread. Please indicate in "Special Instructions" if you would like to add avocado. Please indicate in "Special Instructions" which choice of meat you would prefer beef or chicken or to add avocado. Please indicate in "Special Instructions" if you would like to prefer a different preparation lorraine or vegetarian. With Le Caprice Bread slices. Please indicate in "Special Instructions" which loaf of bread would prefer. Please indicate in "Special Instructions" which flavor you would like scone to be filled with apple cinnamon, blueberry or cranberry-orange. Please indicate in "Special Instructions" which flavor you would prefer apple cinnamon, blueberry, cranberry-orange, double chocolate, marble, poppy seed or vanilla chocolate chip. Please indicate in "Special Instructions" if you would like to add orange, raspberry or strawberry. Please indicate in "Special Instructions" if you would like to add flavour of orange, raspberry, or strawberry. Please indicate in "Special Instructions" if you would like to keep it plain or add flavor of caramel, or chocolate. Please indicate in "Special Instructions" which flavor you would prefer fruit, peer or pecan. Please indicate in "Special Instructions" which slice of cake you would prefer. Please indicate in "Special Instructions" which flavor you would prefer mango, new york style or oreo. Please indicate in “Special Instructions” if you which flavor you would prefer. Choice of Assorted Flavors and various extras!